I am interested in learning how I can get captions on my existing Cisco® phone. Do I need to download software on my Cisco phone in order to use Hamilton CapTel for Business? Can I register for an account on my Cisco phone? How do I activate the Hamilton® CapTel® for Business application on my Cisco phone? I am logged into my account, but the captions are not appearing on my screen. I am unable to log into my Hamilton CapTel for Business account. Can I turn off the captions for some of my calls? Can I review the conversation (scroll up or down) while on a call with captions? Can I review the captions after a call has ended? Is there a charge for using Hamilton CapTel for Business? Is there a third party on the line when I place and receive calls with captions? Are my calls confidential when using Hamilton CapTel for Business? How do I place a call with captions? How do I receive a call with captions? Can I dial an extension and receive captions? Can I dial outside of my phone network and receive captions? Can I access options on interactive voice recording menus while receiving captions? Is it possible to receive captions while listening to my voice mail? Can I call another captioned telephone user while receiving captions on my Cisco phone? Can I transfer a call while captions are on? Can I get captions on a three-way call? Can I place a 911 call with Hamilton CapTel for Business on my Cisco phone? First, contact your Telecom Administrator to download and install the application for enabling access to captions on your Cisco phone. Please refer your Telecom Administrator to this page for more information. Once the technical requirements are implemented, you will then need to register for an account – this is a one-time process. Once your account is established, you can then login on your Cisco phone and start placing and receiving calls with captions. Your Telecom Administrator will be provided with instructions on how to implement the technical requirements of the captioning software. Once complete, they can install the application on your phone. Yes. In order to use the service, you must first register. Simply register for an account on your computer using a web browser. At this time, it is not possible to register for an account directly from your Cisco phone. Registration is a one-time process that only takes a few minutes to complete. Please register for an account on your computer using a web browser. After your Telecom Administrator has established the technical requirements for enabling captions on Cisco phones at your site, they will install the application on your phone. You will need to register for an account. Once registered, open the Hamilton CapTel for Business application, enter your login credentials and submit. You will then be logged into your account. You can turn captions off in between calls or log out at any time. If there are any issues logging into your account, contact your Telecom Administrator. It is possible that you are not logged into your account. To verify, select Settings on your phone and then select the Hamilton CapTel for Business application. If you see a login screen, you are not logged in. Please enter your login credentials and submit to activate captions. If you are logged in, your screen will say “Captions are On”. However, if you see “Captions are Off”, it means you will not receive captions for your phone calls. To activate captions, select the “On” button at the bottom or side of your screen. If you are still unable to receive captions, please contact your Telecom Administrator. If you are experiencing issues with logging into your account, please contact your Telecom Administrator. Yes. You can turn the captions off for any of your calls. First, open the Hamilton CapTel for Business application (select Settings and then select Hamilton CapTel). You will see options at the bottom or side of the screen. Select the “Off” button to deactivate the captions for any calls made and then turn them back “On” to receive captions again. Yes. At the bottom or side of your screen, you will see the options; “Up” and “Down”. Select “Up” or “Down” to activate the request and review captions. To jump to the latest captions after scrolling, simply select the “Live” option. The captions will remain on the screen for you to review, immediately after a call has ended. However, once you exit the application, or place/receive another call, you will not be able to review the captions. Hamilton does not retain or store captions of any calls. The captioning service is available to you at no cost. However, there may be a licensing fee for the software, which will be handled by your Telecom Administrator. Yes, a live Captioning Assistant (CA) hears only one side of the conversation in order to generate captions of what’s said to you through the use of advanced voice recognition software. All calls are kept strictly confidential. As required by law, Captioning Assistants cannot disclose information about a Hamilton CapTel conversation, nor are any records of Hamilton CapTel conversations saved. Please visit the Service Notifications page for information about any service interruptions Hamilton CapTel may be experiencing. After you have logged into your account on your Cisco phone, simply dial the number of the person you are calling. The caption screen will appear soon after you’ve dialed. From that point, you will automatically receive captions on your screen. Other users can dial your number, whether it is your extension or direct number. When the phone rings, simply pick up the handset and activate speakerphone or headset. As you answer your phone, the caption screen will appear instantly and the captions will begin. Yes, you can dial extension numbers within your network as well as any standard 10-digit number. If you are asked to enter an extension number, simply use the number keys as you would for any other call. Yes. You can receive captions on any call, whether inside or outside of your telephone network. Please refer to your internal dialing procedures for dialing an outside line. Yes. You will be able to access options on interactive voice recording menus as you would on any other call. Yes. 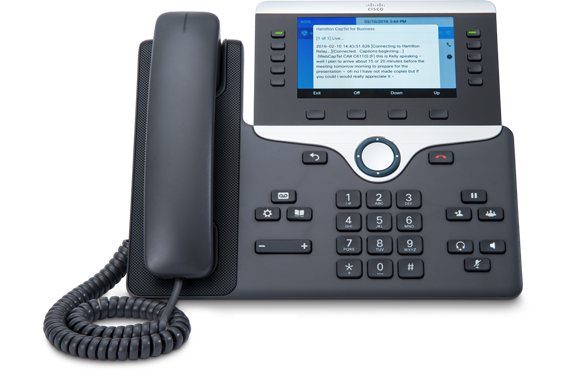 Just follow normal procedures for accessing voice mail on your Cisco phone. Captions will appear on screen as soon as you are connected. Yes, you can call another captioned telephone user. If you are calling another Cisco phone user, you won’t have to do anything special. If you are calling a standard captioned telephone user, depending on their set up, you may need to dial a toll-free number for them to receive captions on their end. You can transfer calls at any time. Simply follow the standard transfer procedures on your phone. For the best experience, you may want to wait until all of the captions have been transmitted to your phone prior to initiating the transfer. Once the transfer is complete and you disconnect from the call, the captioning service will also disconnect. If another person has allowed you to join in on a three-way call, you will be able to receive captions from both parties. You can also initiate a 3-way call when using captions. Simply follow the standard transfer procedures on your phone. For the best experience, you may want to wait until all of the captions have been transmitted to your phone prior to initiating a 3-way call.